For those of you who have enjoyed my regular “In the Trenches” column on Intuit’s blog (now the called Small Business Center) for the past few years, I have some bad news to report. Apparently Intuit has decided to turn the blog into an accounting-focused site that’s populated by internal contributors. That means there’s no place for me (or really anyone else who has built the site into what it is today). 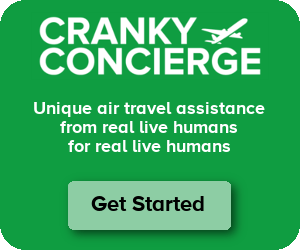 I’ve enjoyed writing the column myself, but it certainly doesn’t fit here on Crankyflier.com. If another site shows interest in a column about the issues a small business must grapple with, then I’d be open to bringing it back in some form. But for now, this week’s column is the end of the road. We recently had a great company meeting in Palm Springs, and thanks to miles and points among other things, we were able to do it for much less than it would cost otherwise. I wrote this column as something similar in idea to what I wrote before about wifi being JetBlue’s secret advantage, but it’s written for a different audience. That’s unfortunate. I have always enjoyed your posts on the intuit blog. Perhaps the Cranky Concierge site could host a blog where you share these insights? I’m actually working on some other areas for this column to live on, but it wouldn’t be on the CC site. I will, of course, keep everyone posted. I love reading about your small business issues as you have a virtual business. Maybe business.com would welcome you. Plus in a few months I know another site that would love to have you as a guest or maybe just interview you if you would be willing. Sorry to hear this. I always enjoy reading your insights into running a small business. I hope you find a new home for it. The blog wasn’t aimed at a reader like me, but I enjoyed it. Sad to see it go. I don’t run a business but I still always read your blogs over at Intuit, and once in a while, something else while I was there too. I appreciated your candor and hope you find another platform for that writing.